How Important is Visual Imagery? E-commerce is continually growing and developing as internet technology advances. 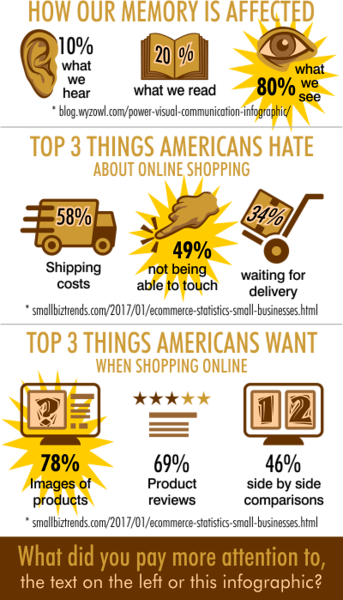 According to Statista.com, "as of 2011, market data showed that over 70% of all adult internet users in the US made online purchases." They also estimate that, "the total number of digital shoppers worldwide grew by over 100 million between 2011 and 2012, and is expected to keep on growing." Smallbiztrends.com states that, "while 49% of online shoppers cite not being able to touch, feel or try a product as one of their least favorite aspects of online shopping," 78% of those polled say it is, "images of products they want a website to have." This makes logical sense since online shoppers can not physically touch or try a product prior to making a purchase. Having the right images can make or break a sale.